Yaupon holly tea: delicious, maligned, caffeinated. 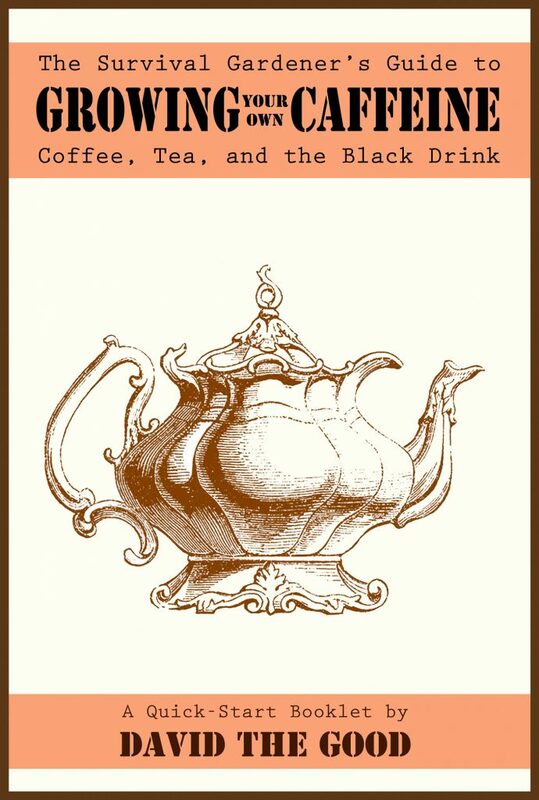 The one thing most people will miss the most in a total societal breakdown is coffee. More specifically… the caffeine inside it. We can live without malls, Tex-Mex restaurants and half-and-half… but coffee? That would be hard. Yet it’s already getting brutally expensive. Before I quit the caffeine habit, I stockpiled extra, just in case, since you just can’t grow the stuff here without a greenhouse. So, in the sad chance we may lose it for a while, there has to be an alternative source of caffeine for those of us with, shall we say, MASSIVE ADDICTION ISSUES. Naturalists gave this plant the unfortunate Latin name Ilex Vomitoria because, as the story goes, the Indians (Native Americans? Savages? Arboreal Peoples? Indigenous Tribespersons? Those Of The Awesome Headdresses?) would make and drink huge quantities of Yaupon holly tea, have visions, ecstatic frenzies, act crazy… and vomit their guts out. Sounds like either a Hippie Vision Quest or a Frat initiation. Clip some nice young leaves and stems. Boil them for a while, until the water darkens to a nice mid-tone green/black. Strain into a teacup, add a little sugar or honey, and serve! 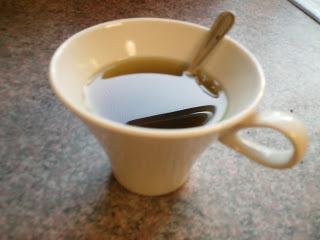 Drink,” but… green yaupon holly tea tastes great too. When I have a little more time, I pick the leaves and toast them on a pan. That gives the tea a nice, smoky Yerba Mate flavor that is quite good. 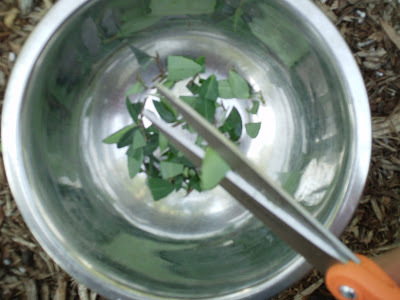 Quick note: don’t chew the raw leaves – they’ll irritate your mouth. If you need caffeine THAT bad, you need to seriously consider rehab. 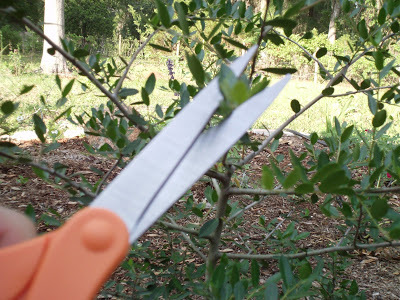 Now, for a long time, I looked around for a Yaupon tree to add to my landscaping. After fruit trees, nuts, berries and tobacco, having a caffeine source was pretty important. Turns out, Ilex Vomitoria is rather popular in Florida as an ornamental. I found my tree at Taylor Gardens Nursery, an excellent native (and exotic) plant source between Ocala and Gainesville off 329 in Sparr. It doesn’t matter if you get the standard, the dwarf or the weeping version… they’re all good sources for THE BLACK DRINK! 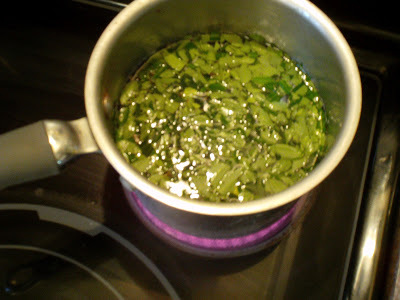 I have found the best way to prepare yaupon for tea is to pick the leaves, boil for 3 minutes (removes some of the saponins (also the boiling water can be used to wash your clothes or pour and ant beds) then I simply dehydrate the leaves then roast them. It is the roasting that releases the caffeine (same with coffee beans) else you are drinking green tea with low caffeine content. We have acres and acres of wild yaupon. I read that the best way to get your Holly On is to snip a stem, let it dry inside away from sunlight, and after two weeks steep the tea- you get a lot more of the caffeine that way, and it's supposed to taste better. Also that dry roasting the leaves at about 400 degrees gives it a very different and super delicious flavor profile. The tea also is a good thing to dump on plants that are having bug issues- most things do OK for me but there's a HUGE problem with squash vine borers + squash bugs in my area, so dumping some on the baby squash plants is probably a good idea. Much less nasty than chemical pesticides, but works pretty well as a short-term fix if you need a bit of help before your predators get in cycle. I appreciate your site. Hope to set one up myself once I get more going on, as new to gardening. I'd be interested in a plant swap. I was hoping you would send me cuttings of the Yaupon Holly and Canna Lilly seeds (I believe I saw that's how they prop) and I would be glad to send some stuff in return, though, I think you may have most of what I have that is perennial. I have chaya, okinawan spinach, katuk and should have some pigeon pea (or gandules as called in PR) growing this Spring. Please let me know. Sounds like I already have all of what you have; however, I'm always happy to share. E-mail me off the sidebar "contact" link. The yaupon revival is on it’s way! There are now 5 companies in the US that sell yaupon tea now and we’re one of them 😉 I love to see people experiment with yaupon, after all that’s how we got started. My favorite way to make it is to roast the leaves and small twigs till they’ve very dark. At home I’d fill a cooking pan up with leaves about 1/2″ thick and roast them in the oven around 300f. They should be done around 30 minutes but it really depends on how much moisture you have in the leaves. We like to grind the roasted leaves up pretty good and put them in the coffee maker at around 1 tbsp per 2 cups. It comes out dark and pretty intense. This method makes a good coffee substitute. We’ll add a splash of milk and if we’re feeling it a little sugar. Delicious! Thanks for the preparation notes. The taste is fine, but I feel a bit queasy in the stomache (2 or 3 out of 10 on the sickness scale) after drinking it the first time, but not near vomiting. That was true both after the first cup and my third cup in a row. I got commercial yaupon packaged in tea bags from ASI, a company in the south. I gave it to my relatives and they liked it. Maybe it’s just me and different peoples’ bodies react differently, or I will get used to it and won’t feel sick in the future. The symptoms may be worse if the leaves aren’t roasted. I can start to see why the Latin name is Ilex Vomitoria. I like trying new things and thought it tasted fine, reminding me of tea. And the theobromina and caffeine are good. I just think I will stick to tea and coffee because of the stomach feeling.